My favourite use for this little bottle of rose-scented magic has to be cleaning my makeup brushes. You just need the tiniest amount. I’ve washed my brushes at least 3 times using the bottle above and it’s barely made any impact at all. It leaves my brushes feeling soft, clean and conditioned, gets out all the crud and all that remains is a gentle rose-scent. What more can I ask for? More varieties? 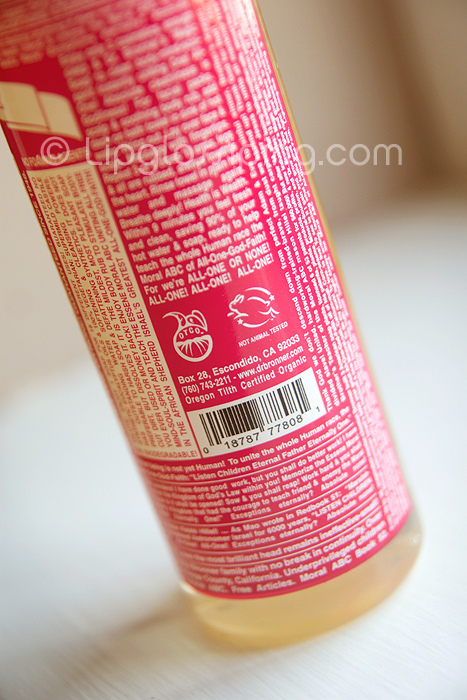 Well… you can have: Peppermint (nice), Eucalyptus (bleh), Almond (yum), Rose (yay), Baby Mild (boring), Citrus (zesty! ), Lavender (bleh) and Tea Tree (meh). Please excuse the childish running commentary that accompanied the variety listing… sometimes I just can’t help myself. Oh yes, they don’t test on bunny rabbits either. I purchase mine from EcoHamster ‘cos they offer free delivery and I like hamsters. £4.95 for 236ml. How do you wash your brushes? Do you mix the soap w/ water or something? OOOOOOOOOOOOOOOOOOOOOOOOOo healthy and not too pricey! me like! Yes, like ndoodles I’m really not sure how I’d feel about having my hair smell like my dishes – but it sounds like a wonder soap! multi purpose products are always my favorite ! 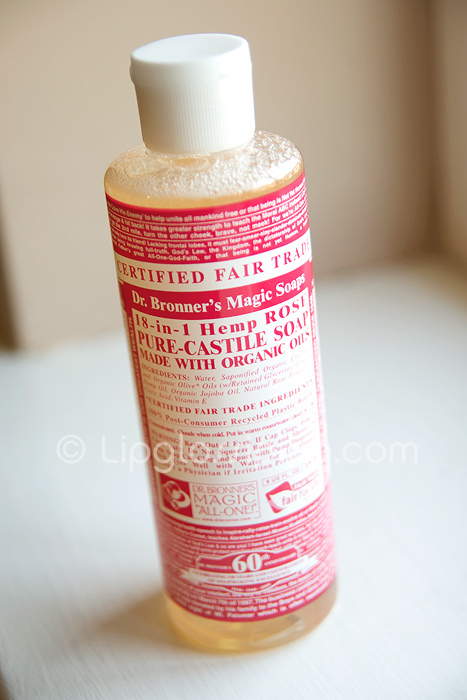 I use Dr. Bronner’s liquid soap in the shower (peppermint) and also to shampoo my hair. It’s great! My husband uses their bar soap (baby mild) in the shower and loves it. And I love how it smells on him after he showers.